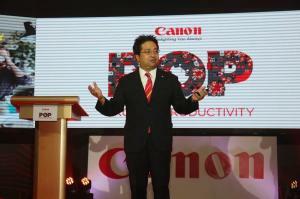 Canon Marketing Philippines, Inc. (CMPI) President and CEO Kazuhiro Ozawa led the launch of Canon’s first-ever technology and solutions expo, POP: The Pros of Productivity. The two-day event shed light on the benefits of productivity for both the company, and its people, which can be achieved by making businesses simple with the help of technology. Manila, Philippines – Canon Marketing (Philippines), Inc. (CMPI) continues to advocate bringing delight to its customers by taking part in helping the country reach its fullest potential through spearheading productivity and efficiency in the workplace. The leading digital imaging solutions provider brought together the pros and leaders of various industries to share their piece on how technology has created avenues for companies to foster productivity, the long-term benefits it brings forth, and how it makes businesses simpler at Canon’s first-ever technology & solutions expo, POP: The Pros of Productivity. “Numerous industries, ranging from enterprises to small to medium businesses, risk 1% of their company’s annual revenue that solely makes up unwanted printing costs. Coupled with document management problems, these non-essentials become a hindrance for companies to achieve overall efficiency and productivity. Problems like these, alongside the recurrent issues we hear from different companies that circle around data security, document retrieval and management, are a few of the menial problems that should easily be lifted off the weight of employees. This stems the Pros of Productivity, one of Canon’s initiatives in putting forward its commitment to becoming an instrument of change to promote a more conducive and productive working environment for the delight of all,” shared Kazuhiro Ozawa, the new CMPI President and CEO. The Canon Pros of Productivity also shed light on common pain points companies undergo on a day-to-day basis, and on first-hand experiences that business operators might be overlooking that are the root cause of minute workflow inefficiencies. The esteemed leaders who shared valuable knowledge and insights from their respective industries during the two-day event were: Acmad Rizaldy Moti, President & CEO of Pag-IBIG; Mon Ibrahim, Undersecretary, Department of Information and Communications Technology; Atty. Francis Acero, Complaints and Investigations Division Chief, National Privacy Commission; Andres Licaros Jr., President and CEO of Asian Hospital and Medical Center; Jubert Alberto, Country Head of the International Data Corporation Philippines; Arnel Sechong, Head of Procurement at DHL Global Business Services; Rene Banzon, Deputy Manager of SIA Engineering; Jan Aliling, Managing Director of Acube Law; Jonathan Yabut, Apprentice Asia winner & Founder and Managing Director - JY Consultancy & Ventures; Seew Choi Gek, Business Development Manager, Therefore Corporation; Dr. Ann Barrameda, Founder of Abba’s Orchard; and Fr. Generoso “Jun” Rebayla Jr. SVD of the University of San Carlos. “The International Data Corporation (IDC) has noted a 21% loss in total productivity per year due to document related concerns. We at Canon hope to be one of the reasons why that number will significantly decrease in the next year or so, in line with staying true to our commitment to cultivating a better working environment across all industries through our technology. The new imageRUNNER ADVANCE Gen 3 product line is just a part of the robust customized technology solutions offered by Canon that we can tailor-fit to address those business problem areas,” shared CMPI Senior Director for Office Imaging Products, Jojo Bolima. “Through this expo, I am looking forward to seeing how we will be able to champion the space of productivity in Philippines where it is most befitting to institute transforming the way we work, and continue to spur delight not just to our loyal customers, but also to whom we believe our products and technology will be able to help,” added Ozawa.